Scalp Infection is a cumbersome affliction that if left untreated can cause extreme discomfort to the point where you’re unable to go about everyday tasks and the quality of life significantly dips. Before we learn the most effective methods and herbal oils for treating scalp infections, let’s begin by clearly defining this condition and how it arises. Unbearable itching, redness, pus-filled blisters, and inflammation identify scalp Infections. Since the scalp is vulnerable to dirt, oil, sweat, and bacterial deposits; infections of the scalp are more common than in other areas of the skin. Scalp Infections are of many types and may be Fungal, Bacterial, or Viral. Nevertheless, it is important to treat them early on before they spread across the scalp and become difficult to manage. Ring Worms are the most common type of scalp Infection and if treated using commercial medicines and products can lead to side effects, the most common being a deterioration in hair quality. Ringworm of the Scalp: Also known as Tinea Capitis, it results in itchy red spots all over the scalp that become painful. Cradle Cap: Cradle Cap, as the name suggests is mostly seen in infants as yellow scales or crusts. Using natural raw oil is the best method of treatment for infants suffering from Cradle Cap. Bacterial Folliculitis: These occur as tiny pimples on the scalp that itch and ooze if broken. A person can get Bacterial Folliculitis from unclean water, salon equipment, or pillows. Tea Tree Essential Oil contains Antibacterial, Antiseptic, and anti-fungal properties that kill yeast, bacteria, and other germs that may cause scalp infections. An effective way to use Tea Tree Oil for treating scalp infections is to mix 3 drops of tea tree oil with two teaspoons of almond oil. This should be massaged on to the scalp and left for a while so that it can work well fighting off the bacteria and infection. Tea tree essential oil is one of the most effective herbal oils for treating scalp infections. Lavender Essential Oil is well-known for its splendid fragrance, healing, and cleansing properties. It also stimulates the oil glands in the scalp that may be underactive. Using Lavender Oil during shampooing or as hot oil treatment is an effective method for treating scalp infections. You could also combine it with Olive Oil and apply to the affected area for a stronger way to get rid of scalp infection. It is an accepted fact that Neem is the ultimate herb for treating skin infections not just in the scalp. Sores, Ulcers, and Ringworms can all be eliminated using Neem Oil. It soothes itchy, dry skin and relives the symptoms of infections while moisturising and nourishing hair. Neem is one of the best natural herbal oils for treating scalp infection and all kinds of skin infections. You can never go wrong with it. Sea Buckthorn Essential Oil is excellent for relieving the symptoms of Scalp Infections like Psoriasis until they’re completely healed. It contains Omega-7 which plays a vital role in treating skin infections. Other properties present in Sea Buckthorn Oil include Vitamins A and E, Fatty Acids, and Flavonoids. All of these substances render it anti-inflammatory and anti-microbial properties. It also has other beneficial properties that promote and support skin health and hair growth if applied directly. Lemongrass works best on fungal and bacterial infections. It is also effective against Yeast which makes it another good choice for treating scalp infections. Its anti-inflammatory properties provide soothing relief. It is a very strong herbal oil for scalp infections like itchy and inflamed scalps. In fact, it is quite strong in its potency so it is recommended to be diluted with a carrier oil before direct application. 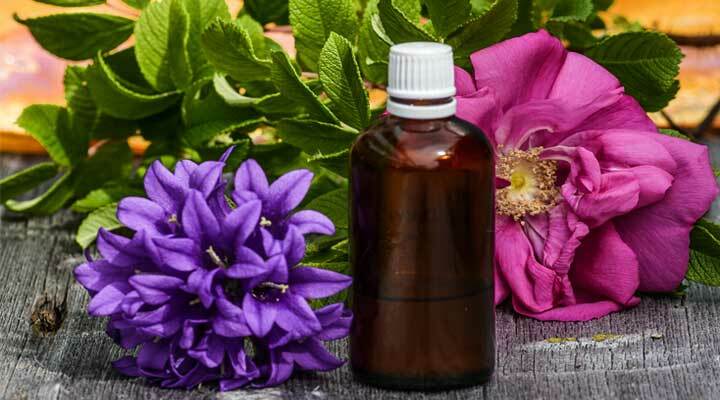 This essential Oil has the power to weed out most scalp problems like Dandruff, scalp fungus, itching, etc. Thyme contains anti-fungal and anti-bacterial compounds like Thymol and Carvacol that act as an excellent remedy against Scalp Psoriasis. Jojoba Oil has excellent moisturisation properties and provides soothing relief to itchy, dry, or flaky scalp that may be the result of a scalp infection. It helps balance sebum production and helps in treating infections like Psoriasis by getting rid of dead skin cell accumulation. Applying Rosemary Oil to an agitated scalp is very beneficial. Thanks to its antiseptic and anti-inflammatory properties. It also stimulates hair growth and leads to healthy, damage-free hair production if used regularly. Lemon Myrtle Oil has a powerful and refreshing fragrance. It contains Citral which is an amazing anti-microbial agent and is a highly recommended herbal oil for treating fungal skin infections. Patchouli is used for making deodorants and incense for its fragrance. For the scalp, application of Patchouli Oil is highly beneficial since it contains Antiseptic, Astringent, and fungicidal properties. It heals wounds and sores while destroying infections and preventing them from recurring. Palmarosa Oil is popularly known for its moisturising properties. It feels cool and soothing when applied on the skin and is especially beneficial for healing an irritated scalp with its anti-inflammatory, antiviral and antifungal compounds thus making it an excellent herbal remedy for Eczema and Dermatitis of the scalp. Melissa Oil has anti-inflammatory properties that helps reduce swelling and soothes pain when applied topically to skin. It prevents bacterial growth and fights skin fungal infections, ulcers, herpes, and skin sores. It is one fo the most widely used herbal oils for treating scalp infections. This essential oil is extracted from the lemon-gum tree, also known as Eucalyptus Citriodora. It is a skin-friendly oil that fights against skin infections of all kinds like Dandruff, Sores, Candida, Cradle Cap, etc. Extracted from a grass called Cymbopogon Nardus, Citronella Oil not only reduces acne, warts, boils, etc. but it is also useful in preventing and treating bacterial and fungal scalp infections while reducing greasiness of hair. Myrrh has several powerful properties including Antimicrobial, Antiviral, Antifungal, Stimulating, Anti-Septic, and Anti-Inflammatory action when applied directly on the skin, especially the scalp. It is a very widely used essential oil extracted from the sap of the Commiphora Myrrha Tree. Scalp Infections are the worst kind of irritants. Although they are not as serious to be life-threatening, but if not treated in the initial stage will almost become unmanageable and cause a lot of discomfort to the patient. Herbal remedies like the ones mentioned above provide soothing relief. Of course, you should always take the opinion of your Doctor and obtain medication if the condition worsens. The scalp requires as much attention as the rest of your body. In fact, it requires more care since it is most prone to infections. Regular washing and maintenance go a long way in keeping scalp infections at bay. Very informative article! These oils work wonderfully to treat scalp infection. I really appreciate this article. Thanks and keep sharing. Right now we are doing a research on the best hair oil for hair loss and hair regrowth oil. Please visit back after one day. Will post an article about the list of hair fall control oil. This is very interesting and a good source of info using essential oils. Great post! I love natural remedies. Will try out some of these. Thank you for sharing! Really good writing! I had so many problems with my scalp. I made my own DIY hair mask. Maybe, I should try another oil from your post and add it into my hair mask! Thanks for sharing.